This animal encyclopedia with a twist showcases more than 100 animals in close-up detail. Arranged from biggest to smallest, the wildlife of the world is revealed with stunning photography and gorgeous illustrations. The storybook descriptions will delight children and let them discover amazing animal facts, such as why the slow-motion sloth is so sluggish and how the plodding pangolin protects itself from predators, as well as some of the stories and myths surrounding their favorite beasts. This beautiful modern collection lets you find the animals that interest you and uncover new favorites along the way. From lions and butterflies to sharks and spiders there's an animal for everyone in this celebration of the animal kingdom. Every animal is shown both photographically and illustrated, and children will love poring over the detailed images. The index is packed with reference information, including the size and location of each species, and a tree of life shows how the animal groups are connected. 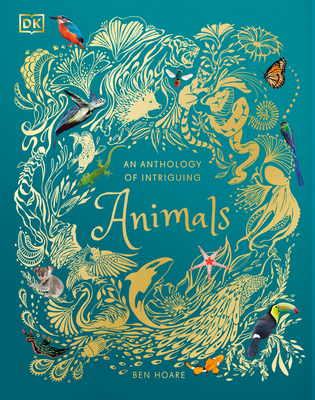 With foil on the cover, gilded edges, and a ribbon for keeping your place, An Anthology of Intriguing Animals makes an attractive gift for any child who can't get enough of wildlife and nature. With engaging information and absorbing images, this book is perfect for children to explore by themselves or for bedtime stories. Ben Hoare is an award-winning journalist who has written and edited many natural-history books and magazines for DK, the BBC, London's Natural History Museum, and many others. Think of a well-known wildlife or nature writer who writes in English, and Ben has probably edited their words at some point. Since 2008 he has been Features Editor of BBC Wildlife Magazine. In 2015 Ben was awarded the Dilys Breese Medal for science communication by the British Trust for Ornithology (BTO)--he is one of only 15 people to hold the award. An Anthology of Intriguing Animals was illustrated by Daniel Long, Angela Rizza, and Daniela Terrazinni.